In your grand master plan, we know the room must be perfect, the sound needs to be flawless and the guests need to be ‘wowed’. We can do that. The WORLD TRADE CENTER Saskatoon at Prairieland Park is where great things happen, made possible, largely-in-part, by our in-house creative design team. Our on-site services include cutting edge, high-quality audio and visual equipment, along with the knowledgeable A/V production team to create almost anything imaginable. Let us know what you were thinking and we can show you how it can be achieved through lighting, video, and sound – creating the perfect atmosphere for your event. Special services such as digital podiums, screens, large scale wall projections, and seamless media integration (even live streaming) are also possible with our in-house team. Each facility offers a built in paging system. Hall A infrastructure now includes built in projectors, screens and sound system. 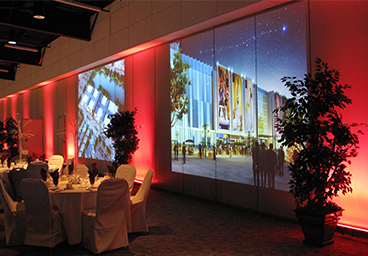 As well, our audio/visual department is able to set up any large banquet or convention event using our in-house gear. This ranges from large screens, projectors, camera, sound and lighting. Contact your Event Coordinator for complete information or contact Jay Boechler. An ELECTRONIC version can be filled out on your computer then printed and faxed or mailed to our office. A PRINT version can be printed and filled out by hand and faxed or mailed to our office. Audio visual techs (IATSE) must be contracted. IATSE, Amusement Tax, BMI, ReSOUND, CAPAC and SOCAN charges will apply where applicable.